The Eupatorium spp. are quite common in the Cayuga Lake Basin, and are among those late-flowering native plants that make our fields so colorful towards the end of summer and early fall. 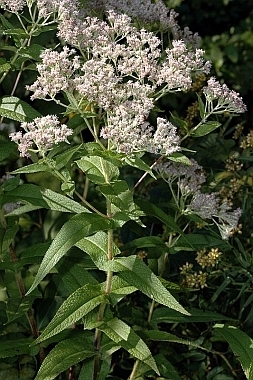 The three most common in our area are Joe-Pye weed, Eupatorium maculatum (now Eutrochium maculatum), white snake-root, Eupatorium rugosum (now Ageratina altissima), and our Native Plant of the Month, boneset, Eupatorium perfoliatum. These three stalwarts grow in open fields along with their cousins, the goldenrods, the asters, and ironweed - all of them members of the Compositae Family. Back in 1924, when Eames and Wiegand published their definitive book on the Flora of the Cayuga Lake Basin, Boneset was apparently so common that they didn’t even bother to name those special sites where Eupatorium perfoliatum could be found. It was just everywhere - from Nova Scotia to Florida and Texas and westward to Nebraska. In the wild it is often seen in the moister soils alongside a stream or pond or ditch but is not fussy about the type of soil. It tolerates some shade. These days as I see it less in the wild I think of it as a handsome stand-alone plant that deserves a place in the garden. Two or three, or even just one plant is an attractive addition and remains so during most of the gardening season. In June and July, as the plant grows, we can appreciate its interesting leaves and then in August and September, sometimes October, we can enjoy its flat-headed white flowers. Its leaves, in fact, are the source of its several names. They are long, pointed, coarse, "felted" green leaves arranged in pairs, with the bases joined so that they appear to be "perfoliate" - literally "growing through". Thus, E. perfoliatum in Latin, and sometimes "thoroughwort" in English. 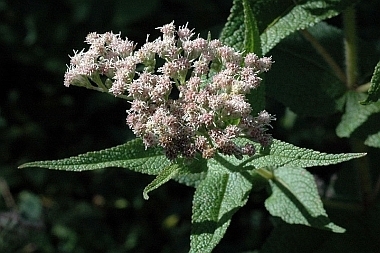 Boneset speaks to its medicinal uses by Native Americans and early colonists. Because of its "perfoliate" -looking growth, the stem resembled a bone to some herbalists, and so the leaves were used both as a poultice for broken bones and also were wrapped in the bandages around a splint. When used as an herbal remedy for colds and coughs the dried leaves were used to make "boneset tea" or a tonic. Today, the leaves just spend their time looking great, growing up in the garden to about 3.5-4 feet, enjoying the sun, tolerating almost any soil, but doing better in a moist setting. I have fairly dry soil, but the added humus helps a lot, and THIS summer, of course, has given us lots of rain and all the water we need. Boneset is just beginning to blossom - check out the accompanying photo to see how lovely this common flower can be.